There is a saying at ShopWildThings and that is "The Best People in the World Own Beaded Curtains". That"s partly because we love Bead Curtains but MOSTLY because we love our customers. 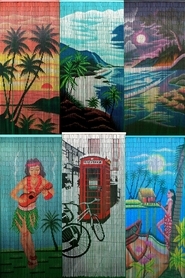 We find that our customers are extraordinarily creative both in their homes and when they are creating spectacular scenes for their own clients. 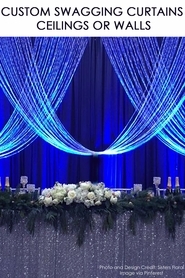 We have been designing, manufacturing, importing, exporting, customizing and loving Beaded Curtains since the early 90"s. We are the absolute authority on all things Beaded Curtains from real glass, metal, to acrylic styles. We have a huge portion of our warehouses filled with nothing but beads! 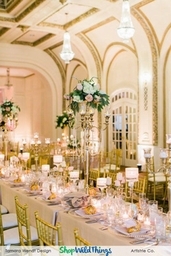 Wedding Decor like Head Table Backdrops Check Out This Designer's Work! 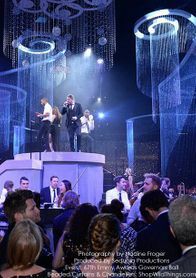 Filling up large, blank Air Space in Large Venues Check out these Ideas! Decor for Homes Feast Your Eyes on This Room! 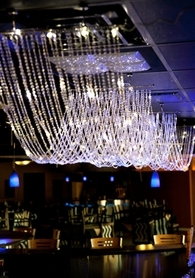 As a Ceiling Treatment Look at How These Ceilings were Transformed! 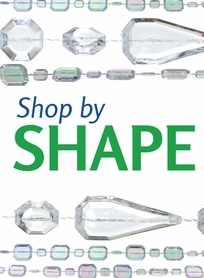 With so many uses for Beaded Curtains, and with the HUGE selection offered here at ShopWildThings, you might wonder which types of Beaded Curtains are best for your application. These are the materials we have available. The descriptions will help you choose the right style for your space and need. The links to the right will take you to each of the different categories of beaded curtains. 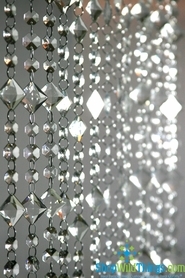 Real Metal Beaded Curtains - Real Metal Beaded Curtains are used for Home, Commercial and Retail Applications. 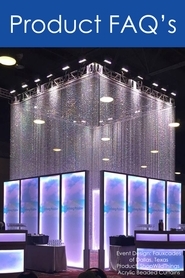 Because they are inherently Fire-Retardant, many Casinos and Special Event Venues Love Chain curtains to Create a high-end look of moving architecture. 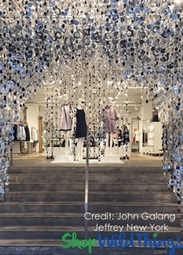 You may have even seen the chain curtains at your local Whole Foods Stores! 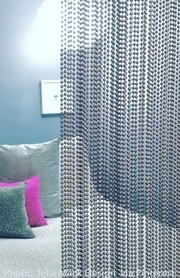 Our Real metal Beaded Curtains are available in a variety of Beads and Finishes and are fully customizable. 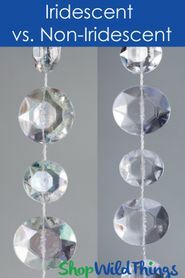 We have different types of Linking Chain as well as BallChain Curtains. 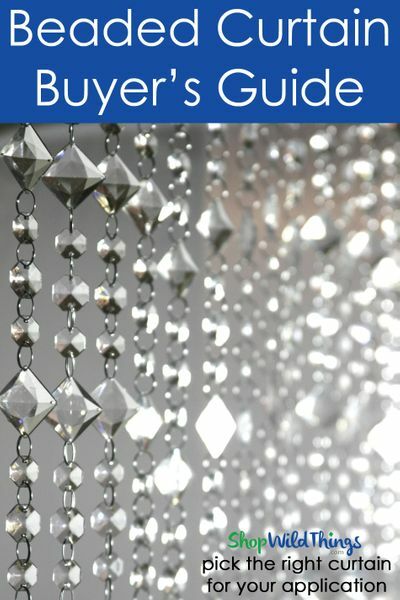 You may order them in ready-made sizes from the website or contact us to make any custom size you'd like to fit your space.Here's a video showing samples of our Custom Made Metal Chain and Acrylic Beaded Curtains. Bamboo and Wood Beaded Curtains - Wooden Beaded Curtains are most popular for home use. Generally these curtains are 3 feet wide and between 6-7 feet long. You can see through them, so they are probably not always the best choice for adding privacy unless you choose one of our Wood Curtains that has a lot of strands. We usually see these curtains used in doorways, but they are just as awesome when hung from the ceiling and used as a room divider. You can hang them right next to each other to cover wider spaces. We have filmed a few videos to help you understand how the Wooden Beaded Curtains might look in your home. See the video here. 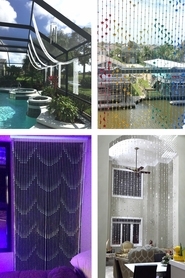 PVC Beaded Curtains - PVC is a material that"s like a thick but bendable plastic that is dye-cut into shapes. The shapes are then attached to one another using silver jump rings. What"s fabulous about PVC is that the "beads" can be really big without adding a ton of weight to the curtain. You can also add or take away length very easy using the jump rings. We have colors and PVC bead styles suited to subtle tastes to Hot Pink and green to suit the Wild at Heart. 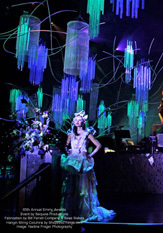 We have a very large selection of PVC Curtains and Chandeliers available. 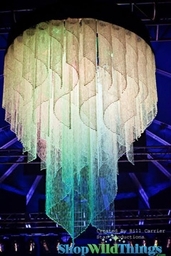 We"ve had a ton of famous designers work with us to create very special installations with our PVC beaded curtains where they"ve made ENORMOUS designs that just would not be possible if not for the light weight of these beads. Watch PVC magic in action! Painted Bamboo Beaded Curtains - The Plain Bamboo and Painted Bamboo Beaded Curtains have thousands of tubes of bamboo strung onto either wire or fiber line. This is a popular choice for home use in doorways. We also have a lot of customers who love Bamboo Curtains to hide the contents of a closet or pantry where the doors have been removed. Because of the high strand count, these will obscure what is behind them, although they will not offer 100% coverage. As an example, we would not recommend using this as a dressing room door�you might be giving more of a show than you want. 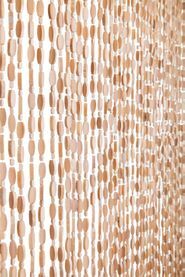 We filmed a helpful video to show what kind of coverage you"ll get with a Bamboo Plain or Bamboo Painted Beaded Curtain that you can watch if you have a minute. Watch this video to decide if a Bamboo Painted Curtain is right for you! Flexible Top Beaded Curtains - Our Flexible Top Beaded Curtains are most often used for applications where a curved wall comes into play. We have ready-made Flexible Top beaded curtains that are on metal tops. They can be added directly to a wall, fixed into your existing track system, or added to trusses. We make Beaded Curtains on Flexible Tops, so you can choose your own beads, specify your sizes, and we"ll make whatever you need! We can even make a FABRIC Top beaded Curtain for you. Need grommets? We do that, too. Fabric Top curtains can have Velcro added to them if you wish. 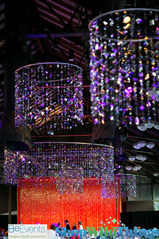 Check out these spectacular Flexible Top Beaded Curtain Installations HERE. Beaded Curtains with Jump Rings - ALL of our PVC Curtains come with Jump Rings and several of our fancier Acrylic Curtains do, too. The beauty of Jump Rings, as described above in the PVC information is that those jump rings allow you to add or subtract length from your curtains in a jiffy. 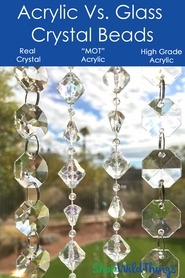 Most of our Acrylic Garlands and Hanging Pendants also come with Jump Rings to attach one bead to the next, so you can match these to the curtains! About Finishes: Customers often ask us what the difference is between Iridescent and Non-Iridescent Finishes. 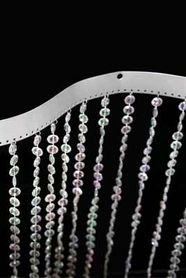 We think you'll find This Page useful where we explain the difference between iridescent and non-iridescent beads. 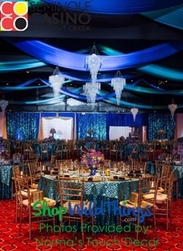 Here at ShopWildThings, we want you to have an amazing experience with your curtains. We know it might sound silly, but we've heard time and again that our beads bring a smile to our customer's faces every time they see them. We LOVE that! If you need help choosing what's right for you, we have extremely skilled folks in the office. We are here to cheerfully answer your questions. We won't pressure you, we'll make sure that you get what's right for YOU! Call us at 928-855-6075 or use the Contact Us form at the top of this page. We can't wait to fill your order! 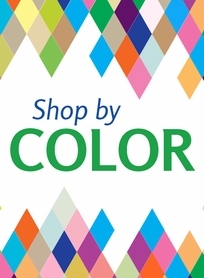 All Products Sorted by Color for Easy Decorating!